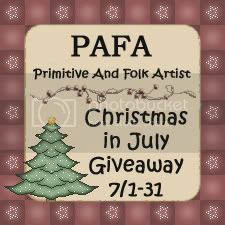 The PAFA team (Primitive And Folk Artist) at Etsy is having a Christmas in July celebration. I made this treasury featuring a small sample of the goodies! Be sure to put the "all items" category. You can also click on the button below to check out some of the items right now. The PAFA team also has a giveaway going on right now!! Click the button to below.